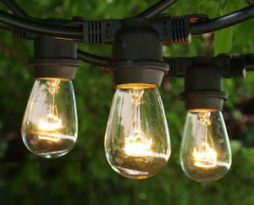 Rent event lighting for your Chicago special party event Lighting purpose and function serve in so many ways. Use there LED rentals as: uplighting, uplights, wall washing, wall wash, pin spoting, pin spots, follow spot. Rent a specialty custom breakout pattern with gobo for displaying white or multi-colored images on many event surfaces. Common custom gobo projections can be found on dance floors, backdrops, walls, ceilings, floors, tent vinyl, and just about anywhere making a custom impact is needed. This package includes one specialty light with gobo for displaying breakout pattern. 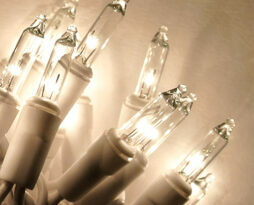 There may be additional costs associated with the installation depending on where the light is hung. We can provide a support structure for this item at an additional cost. Each specialty custom breakout gobo pattern can be shown as white, with a gel as a color, or in color with added LED washing lighting fixtures. Select the proper counts per pattern needed in the drop down list box. Café Italian Bulb String Lighting is a functional and décor element that really adds tremendous event value to your Chicago special event. This lighting rental is used for its aesthetics and its cool look, and also for functionality in providing soft event lighting. We can install Café Italian Bulb String Lighting on your events structure (if allowed) or we can bring out a support structure in which to hang the lighting from. Your venue structure would need to allow us to affix the lighting strings onto it safely. Contact us to set up a design appointment where we can visit your event venue to determine which option is viable. The pricing on this option is for Café Italian Bulb String Lighting rentals that are hung or affixed on your venue structure. Contact us to get separate pricing on café lighting hung on our support system. This rental price per linear foot includes installation. Add a crystal chandelier rental to your Chicago event space to really glam it up! We have installed chandeliers in event spaces, under wedding canopies, under wedding chuppahs, on the outside patios and decks of event spaces, and under so many ceilings. 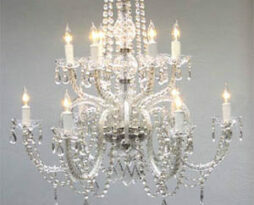 The Swarovski trimmed chandeliers come in three sizes, Small, Medium and Deluxe. The small chandelier is approximately 10lbs and has 5 candles. The Medium chandelier is approximately 20lbs and has 8 candles. The large chandelier is approximately 40lbs and has 16 candles. 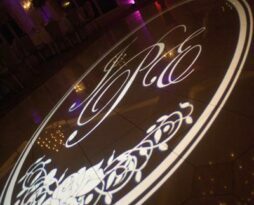 Rent a specialty light with gobo for displaying monogram initials on many event surfaces. Common custom gobo projections can be found on dance floors, backdrops, walls, ceilings, floors, and just about anywhere making a custom impact is needed. This package includes the specialty light with gobo for displaying monogram initials. 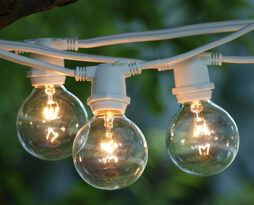 There may be additional costs associated with the installation depending on where the light is hung. We can provide a support structure for this item at an additional cost. Green corded multi-colored bulb string lighting is a décor element that really adds tremendous beauty to your Chicago special event during the holiday season or to add that flair at your event at any time of the year. 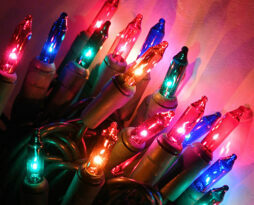 This lighting rental is used for its aesthetics and its cool festive look. We can install green corded multi-colored bulb string lighting on your events structure (if allowed) or we can bring out a support structure in which to hang the lighting from. Your venue structure would need to allow us to affix the lighting strings onto it safely. Contact us to set up a design appointment where we can visit your event venue to determine which option is viable. The pricing on this option is for green corded multi-colored bulb string lighting rentals that are hung or affixed on your venue structure. Contact us to get separate pricing on café lighting hung on our support system. This rental price per linear foot includes installation. Colored corded mini LED string lighting is a functional and décor element that really adds tremendous beauty to your Chicago special event. This lighting rental is used for its aesthetics and its cool look, and also for functionality in providing soft ambient event lighting or targeting on a marketing or branding feature. Colors available ATM: Pink, Multi, Purple, Blue, Green, Red, Yellow, Cool White, and Warm White. 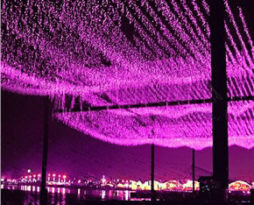 We can install string lighting on your events structure (if allowed) or we can bring out a support structure in which to hang the lighting from. Your venue structure would need to allow us to affix the lighting strings onto it safely. Contact us to set up a design appointment where we can visit your event venue to determine which option is viable. This pricing listed is for basic setups, please call us to inquire on specific setup types. The pricing on this option is for White corded white bulb string lighting rentals that are hung or affixed on your venue structure. Contact us to get separate pricing on café lighting hung on our support system. This rental price per linear foot includes installation. White corded white bulb string lighting is a functional and décor element that really adds tremendous beauty to your Chicago special event. This lighting rental is used for its aesthetics and its cool look, and also for functionality in providing soft ambient event lighting. We can install white corded white bulb string lighting on your events structure (if allowed) or we can bring out a support structure in which to hang the lighting from. Your venue structure would need to allow us to affix the lighting strings onto it safely. Contact us to set up a design appointment where we can visit your event venue to determine which option is viable. 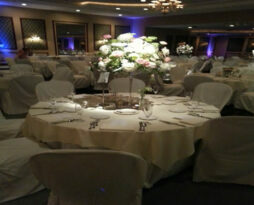 Rent our table centerpiece LED pin-spots and really provide focus on your floral table centerpieces. Pin-spotting can provide illumination to on of the most expensive décor items you have in your room, your floral arrangements. We utilize both wired and wireless pin-spotting fixtures to illuminate your table centerpieces. Our wireless batter operated unit can match any wired fixture, lumen for lumen. Many clients are so surprised with the light intensity provided by our LED wireless pinspot. We can affix these LED or traditional pinspot lights to your venues ceiling or we can provide our “Touchless” system that provides all hardware needed to properly hold this equipment without touching a venue wall or ceiling. The price of this unit is for the light fixture itself. Installation and the use of our “Touchless” system is separate and will be configured once we identify what we are attaching to and what the installation parameters are. This item is very properly rented for wedding ceremonies, product launches, corporate events, and tradeshows. Rent our wall up-lighting LED wall washers and really provide an ambient event experience. Wall accenting is one of the most important aspects you should consider adding to your special event space. It provides an added spark of color and ambience that really highlights your event space. Think about it, do you normally use wall washing in your home. At work? Its just an “event thing”. 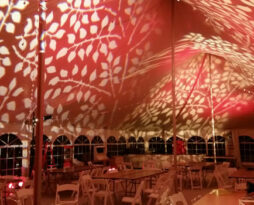 Utilizing up-lights is an essential part of any special event. 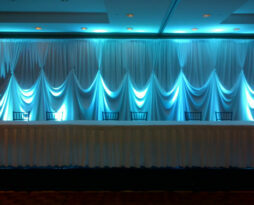 We utilize both wired and wireless up-lights to illuminate your venue. Our wireless battery operated unit can match any wired fixture, lumen for lumen. Many clients are so surprised with the light intensity provided by our LED wireless wall lights. This item is very properly rented for wedding ceremonies, product launches, corporate events, anniversary parties, mitzva's, and tradeshows.